The First stage of a child's educational development is before he or she enters the formal education system. As such parents have a major role in this stage. However, the Government cannot disclaim its responsibility to ensure, oversee and guide pre-school education. Unfortunately this vital area of education has received only scant attention of the government in our country. The parental thirst for educating their offspring is being utilized by unscrupulous elements and sub-standard private pre-schools are widespread. There is no regulatory authority for pre-school education and most nurseries and pre-schools employ untrained teachers. There is also a lack of day-care centres for children of working couples and only a handful of employers have day-care centres for children of their employees. Problems of primary education begins with the child's admission to Grade One. For several decades there has been no satisfactory method of admitting children to Grade One. Even the Supreme Court had to interfere in ensuring a uniform standard of admission. However, this issue will remain problematic until the quality and quantity of education imparted becomes uniform and non-discriminatory throughout the island. This is no easy task and would require extensive financial, human resources as well as dedication, sacrifice and fair-play by all concerned. The huge resource gap, both human and material, among different schools has to be bridged according to a plan. Such a plan has to consider the continuous development of the child who enters Grade One. For several decades now the government has been talking of developing two schools in every Divisional Secretary division. This is hardly adequate. It is based on World Bank advice which seeks to "rationalize" education expenditure. Education is considered here as expenditure and not as an investment, which actually is the case. The inadequacy of this approach could be seen in relation to two factors. First, it clashes with the obligation of the government to provide quality education to all children. Second, is that such an approach does not take into account the density and magnitude of the population in various region as well as their specific needs. For example, the Divisional Secretariat divisions are different in area, population, number of available schools and their resources, transport and health infrastructure etc. There are 331 Divisional Secretariat divisions which consist of 14,622 Grama Niladhari divisions. In 2014 there were 10,973 government schools all types. This number has now reduced by about 1,000 due to the closure of schools with few students. Even if one adds private and so-called International Schools, the actual total number is apparently inadequate since it does not guarantee at least a single school for each village, especially in remote areas with scarce transport facilities. Poor parents are unable to send their young ones to schools several kilometres distant, with the result they get marginalized. Another result is the increasing number of school drop outs before completing formal school education. Some dropout even at the primary level. Despite its limitations the expansion of the number of schools, especially Maha Vidyalayas in the 1960's did contribute to the growth of a swabhasha educated intelligentsia and a wider dissemination of knowledge. A reverse process is now taking place though in a smaller scale. In an effort to streamline the schools system the government attempted several times to separate primary and secondary schools. It failed due to pressure from parents of schools with better facilities and parents and old student associations with political clout. Thus only primary sections of secondary schools in remote or less affluent environs were removed creating an imbalance. There should be no more haphazard reforms of this nature, especially those imposed from above. Command-type administration is harmful. All educational reforms should be preceded by adequate public discussion and debate among all stakeholders if they are to be democratic. Planning is an essential component of developing education. It should be based on a national policy framework, which is unfortunately so far lacking. What appears is that governments are implementing World Bank induced reforms with a political colouring. That is why we find the same reform being implemented under different names. For example the Navodya school programme gave way to Mahindodya programme and now the 1,000 schools programme. Under World Bank instructions the government reduced expenditure on education from around 4 or percent in the 1960s to a little over one percent by 2014. The World Bank introduced a concept that schools should lookafter their own funding to reduce the burden on the government. School development societies were formed for this purpose. What happened is common knowledge. Only a handful of city-based schools could afford to do so. The majority of schools could not manage as the parents of children were not rich enough to provide required funds. Nor did the business community help. In this context the present government should be commended for setting a goal of allocating 6 percent of the GDP for education. However, a genuine effort should be made without gimmicks with statistics as it was revealed during the last Budget debate. Most of the expenses consist of necessary recurrent expenditure so that capital expenditure requirements fall behind. This is a problem that should receive urgent attention. The increasing number of schoolchildren seeking private tuition is a sad reflexion on the quality and content of teaching imparted at school though there are other reasons for the proliferation of tuition classes. The number of incidents of unethical practices of teachers reported in the media has also risen. Incidents of bribery and corruption in the school system involving school principals are also large. There is also a huge imbalance in the availability of necessary teaching cadre in most schools in spite of credible indices. For example, the teacher-pupil ratio is supposed to be 1:17 which only hides the actual disparities that exist in comparing school by school. It is common knowledge that better schools, classed as National have a better teacher-pupil ratio than provincial schools, especially those populated by children of less affluent parents. The existence of a district based preferential treatment in University admissions is an admission of such anomalies, However, it does not take into consideration the differences in material and human resources of schools within districts so that children of less affluent schools in the cities are at a double disadvantage. There should be a system of grading schools and those with lower ranking should be given additional assistance to overcome their backwardness in order to achieve equity. Training and motivation of teachers should be a continuous process. For an efficient teaching service it is essential to improve their salaries and working conditions. 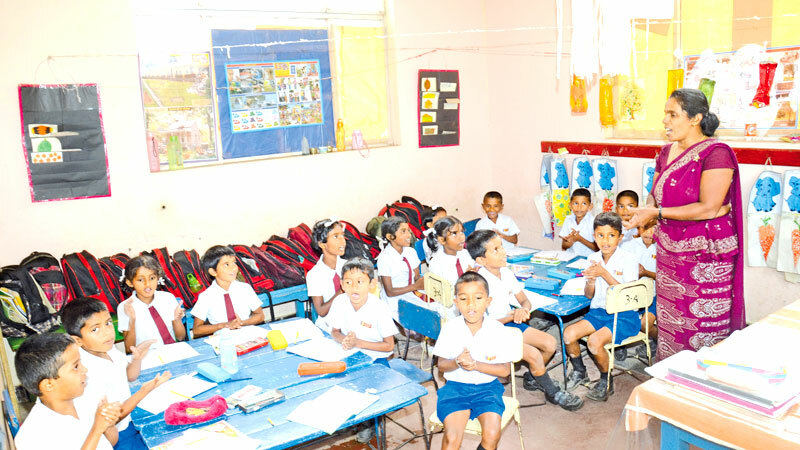 It is no secret that Sri Lankan teachers are worse paid than their counterparts in other SAARC region countries, not to mention those in the developed world. As the salaries and working conditions are meagre schools cannot absorb the best talent which flows elsewhere. In fact teaching may the last refuge of many a graduate or he or she may be considering it only as a stepping stone to another career.